Somewhere in the Australian Outback, right now, a boom is happening. Rain is falling and birds are breeding – fast – as they must. Most of Australia is desert. There is no ‘rainy season’ in the Outback. 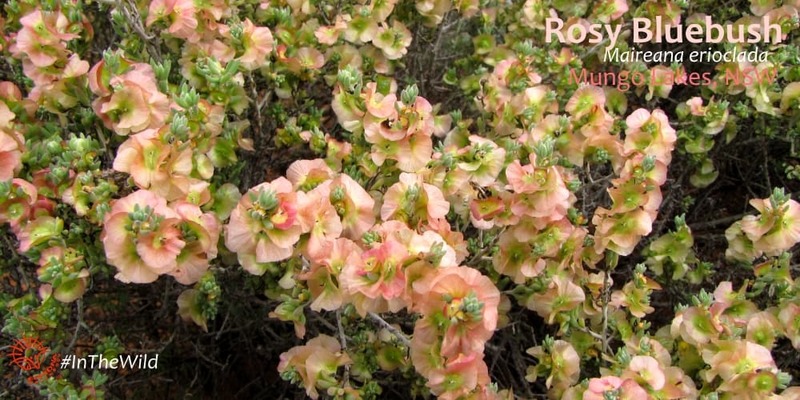 Rain comes rarely, in thunderous torrents that fill long-dry rivers and lakes and paint the desert green, gold and pink. It is hard for most animals to cope with this boom and bust, yet Australia has a diverse, abundant and colourful fauna. Our Outback birds and mammals are superbly adapted to breed, raise babies and breed again in the short weeks of good conditions. It may be decades before they get another chance, so they approach breeding with gusto. The Boom Birds: Budgerigar, Cockatiel, Letter-winged Kite, Crimson Chat and Black-tailed Native-hen embody the spirit of the Outback. They carry adventure and courage in their feathers. Nothing dampens their pioneering – they try, try and try again until finally they succeed. I’ll never forget finding some these birds on dry Lake Mungo in Outback Australia. After fourteen years of drought, rain finally came in February 2010. By September the boom was on. 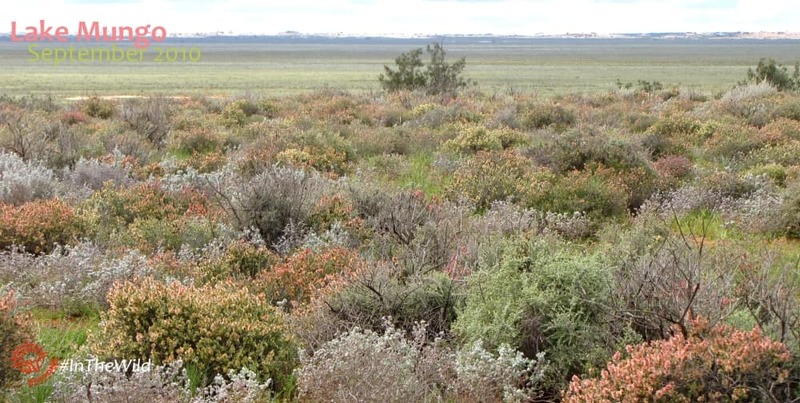 We arrived at Mungo National Park on 6 September 2010 to find puddles and shallow pools everywhere, and bluebushes and saltbushes in heavy flower. We saw Cockatiels and Chestnut-crowned Babblers breeding, Rufous Songlarks in large numbers, many Emus and Red & Western Grey Kangaroos. Read about curious teenage Emus at Mungo. Twenty chicken-sized black birds with mint-green beaks ran past on strong red legs. They looked like waterbirds, but were running away from the water and into the sand dunes! 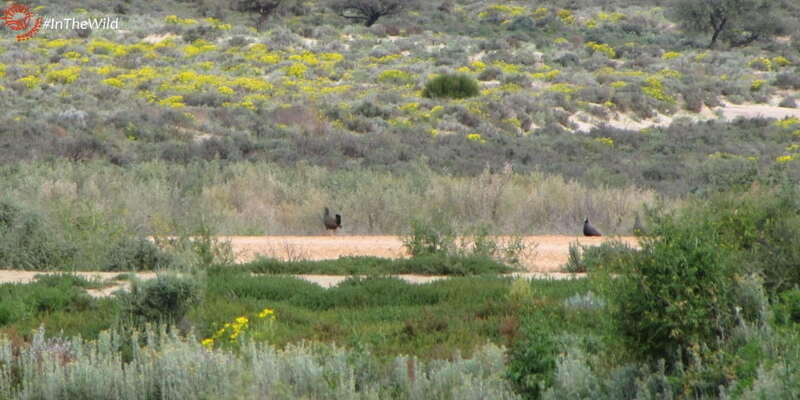 They are Black-tailed Native-hens and they come because of the rain, but its the abundant growth of desert plants that they love. 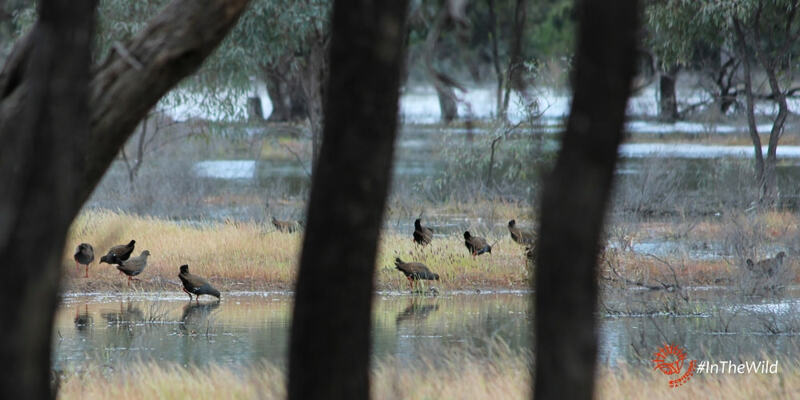 Black-tailed Native-hens are irruption* specialists: they capitalise on the rare but phenomenally rich rainfall events in Australia’s desert, then spread across vast areas of the continent in huge numbers. 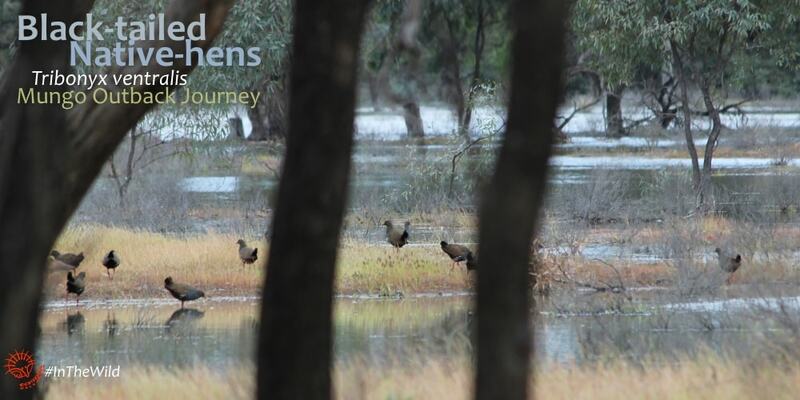 All over the southern outback, from 2010 through 2012, reports of native-hens poured in. We saw them again at Hattah-Kulkyne National Park on 10 May 2011. 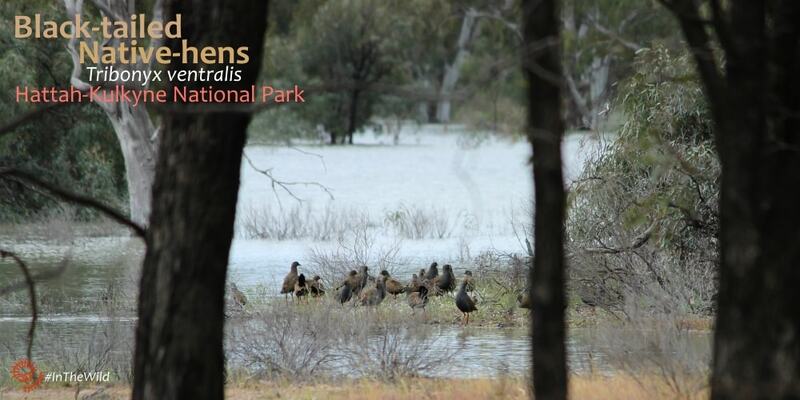 Then around 7 November 2011 Roger saw thousands of Black-tailed Native-hens crossing the road around Renmark, South Australia. It wasn’t until September 2017 that we saw them again in the Outback. 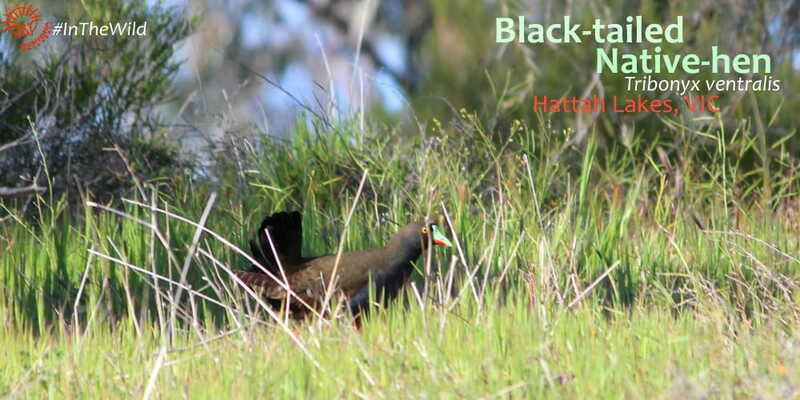 Most years Black-tailed Native-hens live in small numbers around reliable water sources in the Murray-Darling basin in south-eastern Australia, the Cooper Creek system in central Australia and the coast of Western Australia. Watch this slideshow of where Black-tailed Native-hens were found in the Outback from 2007 to 2017. Images compiled from eBird reports – note purple boxes show occurrence, not abundance. Dark purple = birds seen on most surveys; light purple = birds seen occasionally. When conditions are perfect, as they were in 2010-2011 and then again in 2017, Black-tailed Native-hens breed up into huge numbers. They then move out of their refuges and onto the desert plains in their thousands. At these times the birds are not hard to find in the Outback. This slideshow shows the rainfall from 2007 to 2017, compiled from Australian Bureau of Meterology. Black-tailed Native-hen abundance is closely tied to rainfall, but delayed by months. The good times can last a few years – native-hens were still being seen widely in 2012 even though rainfall was poor that year. Tip: To pause both gifs in chrome you can mouse left click the X (close window) button and hold it. But make sure you move the mouse off the X button before releasing, or you will close the window. Our 4 day Mungo Outback Journey travels into the southern edge of Australia’s Outback, where we find birds, mammals and reptiles of the Outback, the Mallee and of the great inland rivers: the Murray & the Darling Rivers.